Whether you are at a regatta, weekend or club racing, our line of laminates by Dimension Polyant provide light weight, low stretch fabrics to help you get to the weather mark first. 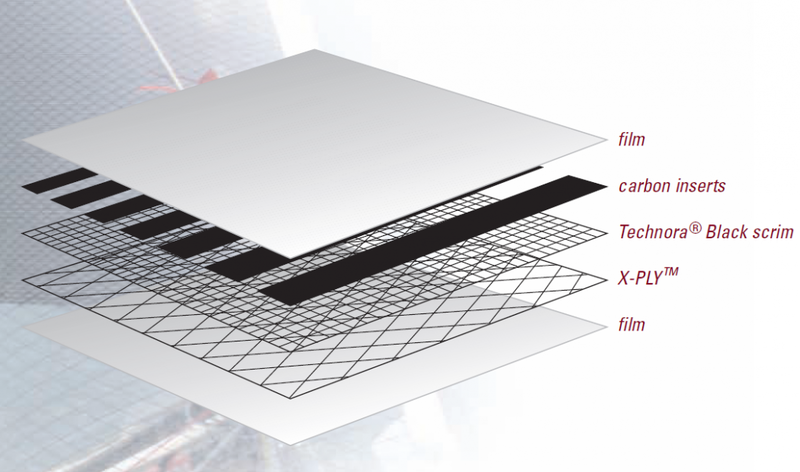 Two layers of film combined with pretension warp, fill and X-PLY® fibre bundles make these laminates a perfect match for Tri Radial panel construction. Available fibres include Polyester, Aramid, Technora and Carbon to suit your boat size and inventory requirements. For the ultimate in strength , performance, plus added durability, we also offer CS Carbon Sport Lite Skin™ and GPL Carbon Lite Skin™. Unlike woven taffeta, Lite Skin™ contains a thin, light weight natural array of non-woven filaments that sandwich the base laminate. This increases abrasion resistance at a minimal weight gain compared to woven taffeta. Lite Skin™ products come with a light gray opaque colour finish. Full PDF Information Sheet Coming Soon.